A few months ago I wrote a blog titled Using FrontPage 2003 to Bulk Rename Images Using VBA, in which I shared a VBA macro that renamed all of the images in a website to a common file-naming syntax. In that blog I explained my reasoning behind my use of the long-outdated FrontPage 2003, and that reason was that FrontPage's "Link Fix Up" feature replicates file renames across your entire website. This single feature can greatly reduce your development time for websites when you have a lot of renaming to do. Recently I ran into another interesting situation where combining with FrontPage's VBA and "Link Fix Up" features saved me an incredible amount of time, so I thought that I would share that in today's blog. I recently inherited a large website with thousands of images that were spread across dozens of folders throughout the website. Unfortunately, this website was created by several developers, so there were a large number of duplicate images scattered throughout the website. It would have taken me several days to remove all of the duplicates and edit all of the HTML in the web pages, so this seemed like a task that was better suited for automation in FrontPage 2003.
' Define the file extensions for image types.
' Define the images folder name.
' Retrieve the URL of the website's root folder.
' Define the root-level images folder URL.
' Set the initial search status to not found.
' Loop through the root-level folders.
' Search for the images folder.
' Exit the loop if the images folder is found.
' ... and create it if necessary.
' Loop through the collection of images.
' Retrieve the file extension.
' Test if the file extension is for an image type.
' ... and move the file if it is not. The second parameter is set to True in order to update hyperlinks during the move process; this is the "Link Fix Up" feature. The third parameter is set to True in order to overwrite duplicate files; this has the potential to be a destructive operation if you are not careful. In my situation that was acceptable, but you might want to double-check your content first. Despite the plethora of other tools and editors that I use to create websites, there are times when I simply have to dust off my copy of (gasp!) Microsoft FrontPage 2003. It may be a dinosaur, but there are some things that it does really well, and periodically I simply need to use it. An often-mocked and yet critically essential feature that FrontPage 2003 provided was affectionately called "Link Fix Up," which was a feature that would replicate file renames across your entire website. In other words, if you had a file that was named "foo.html," you could rename it to "bar.html" and FrontPage 2003 would update every hyperlink in every file in your entire website which pointed to that file. Needless to say, this feature was often indispensable when I was working with extremely large websites. Other applications may have similar features, but when you combine that feature with FrontPage 2003's built-in Visual Basic for Applications (VBA) functionality, you have a really powerful combination that can quickly seem indispensable. I created a mixed-media website some years ago where I had thousands of images that were named like IMG5243.1024x768.png, IMG2745.1280x1024.png, IMG6354.800x600.png, etc. Some part of the file name obviously contained the image dimensions, which was useful at the time that I created the website, but that information was no longer necessary, and the filenames made the Obsessive Compulsive side of my behavior start to act up. (Too many characters.) With that in mind, I decided that I would rename all of those images back to simpler names like IMG5243.png, IMG2745.png, IMG6354.png, etc. Here is where I quickly ran into a problem - I hadn't standardized my file naming syntax. (Shame on me.) A lot of filenames had other parts or character strings that were going to cause problems, for example: IMG5243.1024x768_cropped.png, IMG2745.edited_1280x1024.png, IMG6354.new_800x600_small.png, etc. This meant that I was going to have to crawl through each filename character by character and look for image dimensions. This is not difficult through VBA, but it added a bit of complexity because I would have to locate any "x" character in a filename and then starting working my way to the right and left to see if it was surrounded by numbers. In other words, I would have to traverse every file name like "aaa_123x456_aaa.jpg" and "aaa.123x456.aaa.jpg" in order to remove "123x456," while leaving "aaa.wxy.jpg" untouched. Of course, there were also topics to be considered after I removed the numbers, like malformed image names like "aaa__aaa.jpg" and "aaa..aaa.jpg" that had unnecessary character duplications. All that being said, here is the VBA macro that I created, which worked great; I was able to have this macro rename my thousands of images in a matter of seconds, and FrontPage 2003 made sure that every image URL in my HTML/ASP files were kept up-to-date.
' Define the list of file extensions to process.
' Create a dictionary object to hold the list of old/new filenames.
' Verify that a website is open; exit if not.
' Loop through the files colleciton for the website.
' Retrieve the file extension for each file.
' Verify if the filename is part of the valid list.
' Verify a multi-part filename.
' Split the multi-part filename into sections.
' Loop through the sections.
' Verify that each section actually has characters in it.
' Check for a lowercase X character.
' Make sure that the X character does not start or end the string.
' Make sure that the X character has numbers to the left and right of it.
' Initialize the width/height strings.
' Loop through the string to find the height.
' Loop through the string to find the width.
' Remove the width/height string from the current filename section.
' Reassemble the file sections.
' Cleanup several unnecessary character sequences.
' Add the old/new file URLs to the dictionary.
' Loop through the collection of URLs to rename.
' Avoid collisions with existing URLs. First of all, this macro intentionally avoids overwriting the destination filename if it already exists. For example, if you have two files named IMG1234.100x100.jpg and IMG1234.200x200.jpg, simply removing the image size characters from each file name would result in a collision for the name IMG1234.jpg. What the macro currently does is to rename the first file, then it leaves any possible collisions unchanged. You could easily modify this script to prompt the user what to do, or you could configure it to rename each file with a syntax like IMG1234a.jpg / IMG1234b.jpg / IMG1234c.jpg, but I'll leave that up to you. Second, I wrote this macro for a specific set of file types and filenames, but you could modify the macro for a variety of scenarios. For example, one developer that I knew liked to test his content on his production server by creating preview files with names like foo.preview.html and bar.preview.aspx. This allowed the production files to coexist on the same server with the preview files, although the production files would have the production-ready filenames like foo.html and bar.aspx. Once he was ready to push the preview files into production, he would simply rename the necessary files. This system worked for a small set of files, but it didn't scale very well, so the amount of labor on his part would increase as the website grew more complex. (Of course, he should have been using a development website for his preview testing, but that's another story.) In any event, this macro could easily be modified to remove the ".preview." string from every file name. Please note that this information is being presented "as-is" and is not officially supported by Microsoft or RTR. 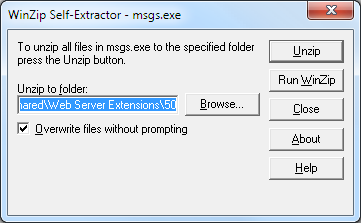 Extract the FPSE 2002 files by double-clicking the MSGS.EXE file and specifying an output folder. If you run the installation package on your server and accept the default path, then all of the languages will be available on your server. Choose the language abbreviation for your desired language from the list below. For example, if you were using German your abbreviation would be "de-de." See http://msdn.microsoft.com/en-us/library/0h88fahh.aspx for additional information about these languages and their related codes. That's all that there is to it. Once again, please note that the version of the FPSE 2002 from RTR is only supported in English; so if you are having any issues, you will need to change the value of the vti_defaultlanguage entry back to "en-us" before you contact RTR for support. In this latest installment on my series about configuring your server for hosting without the FrontPage Server Extensions (FPSE), I'd like to discuss a couple of WebDAV best practices that I like to use. _fpclass Should contain publicly-available FrontPage code - but should be secured. _private The FrontPage Server Extensions often keep sensitive data files in this folder, so it should be secured to prevent browsing. _vti_bin This is the virtual directory for the FrontPage Server Extensions executables. This path is configured to allow executables to function, and since we are migrating sites to WebDAV it should be secured to prevent browsing. _vti_cnf The FrontPage Server Extensions keep sensitive metadata files in this folder, so it should be deleted or secured to prevent browsing. _vti_log The FrontPage Server Extensions keep author logs in this folder, so it should be deleted or secured to prevent browsing. _vti_pvt This folder holds several files that contain various metadata for your website, and should be secured. _vti_txt This folder contains the text indices and catalogs for the older FrontPage WAIS search. Since later versions of FrontPage only used Index Server, it is safe to delete this folder, but at the very least it should be secured to prevent browsing. fpdb FrontPage keeps databases in this folder, so it should be secured to prevent browsing. Note: You should only enter the following commands if you are sure that you will not be using FPSE anywhere on your server! These settings will prevent any of the FPSE-related paths from being viewed over HTTP from a web browser; web clients will receive an HTTP Error 404.8 - Not Found message when they attempt to access those paths. But that being said - when you enable WebDAV for a website by using the Internet Information Services (IIS) Manager, it will configure the Request Filtering settings that enable WebDAV clients to access those paths through WebDAV requests, even though access from a web browser is still blocked. (All of this is made possible through the built-in integration between WebDAV and Request Filtering. ;-]) Enabling access to these folders over WebDAV is necessary if you are opening your website over a WebDAV-mapped drive while you are using authoring clients that do not have native WebDAV support, such as FrontPage or Visual Studio. There is a list of several reasons in that blog post why using two sites that point to the same content can be beneficial, and I won't bother quoting that list in this blog post - you can view that information by looking at that post. This configuration helps alleviate problems from uploading invalid Web.config files that might otherwise prevent HTTP access to your website. By way of explanation, the WebDAV module attempts to validate Web.config files when they are uploaded over WebDAV - this is done to try and prevent crashing your HTTP functionality for a website and being unable to fix it. Here's what I mean by that: IIS 7 allows configuration settings to be delegated to Web.config files, but if there is a mistake in a Web.config file, IIS 7 will return an HTTP Error 500.19 - Internal Server Error message for all HTTP requests. Since WebDAV is HTTP-based, that means that you won't be able to fix the problem over WebDAV. (If the WebDAV module didn't perform any validation, that means that your website would become unusable and unrepairable if you had uploaded the bad Web.config file over WebDAV.) To help alleviate this, the WebDAV module performs a simple validation check to prevent uploading invalid Web.config files. But if you save an invalid Web.config file through some other means, like the local file system or over FTP, then you will have no way to repair the situation through WebDAV. Note: you need to update the highlighted section of that example with the name of your website, such as "Default Web Site," etc. When you have two websites configured in this example and you have an invalid Web.config file that is causing the HTTP 500 error for the www.example.com website, you can still connect to authoring.example.com via WebDAV and fix the problem. Life after FPSE (Part 4) - This blog post discusses a couple of WebDAV-related topics, and includes my list of additional reasons why configuring two websites when you are using WebDAV can be advantageous. Adding Application Pools - This topic contains the detailed information about the enableConfigurationOverride setting for an application pool. Using the WebDAV Redirector - This walkthrough discusses mapping drives to WebDAV-enabled websites. I've had a few questions about getting the FrontPage 2002 Server Extensions (FPSE2002) AllowUNC feature to work with Windows Server 2008, so I thought that I would put together a blog from some of the information that I had been giving out whenever someone was having problems. "Creating and Configuring a Virtual Server in IIS"
"Configuring Security Settings for the Virtual Server"
"To Configure the Registry for the Web server"
"To Enable FrontPage Server Extensions 2002"
The body of this blog post is an excerpt from the whitepaper, and contains only the steps that I used to get my test scenario up and running. For my test, I set up a domain controller, a file server, and a web server; all running Windows Server 2008 or Windows Server 2003. I include notes when necessary to highlight issues that I ran into. I cannot stress enough that setting up this configuration is not an easy task to perform, if you skip any steps that I have listed - the functionality will not work. Some of the AllowUNC functionality is not implemented through the UI; you have to make changes to your registry to enable it. All servers must be Windows 2008 Servers or Windows 2003 Servers in an Active Directory domain. In the "To Share the Folder" steps I added the domain-level IUSR account to the permissions on the shared folder so that anonymous would work. In the "Configuring Security Settings for the Virtual Server" steps I used Basic Authentication as this is the most common Internet-based method. I only tested this with a UNC share on a Windows-based server, I did not test with SAN or NAS devices so I am not sure if they would work. You must configure a shared folder on the file server and grant the Web server access to the contents of that folder. Note that you must set the permissions for the folder itself, not a parent folder. It is recommended that you also implement IP Security on the file server, so that only the Web server, the domain controller, and other administrator computers can access the file server over TCP/IP. For more information about configuring IP Security, see Setting Up IPsec Domain and Server Isolation in a Test Lab. In My Computer, create or locate the folder that will contain the Web site content. Right-click the folder, and click Properties. In the Properties dialog box, click the Security tab. Click Advanced. If you are using Windows Server 2008, click Edit. Type Administrators, and then click OK. Select Full Control, and then click OK.
Click Object Types, and then in the Object Types box, select the Computers check box, and then click OK. In the Enter the object names to select box, type the Web server computer name, followed by a dollar sign ($) and then click OK.
Clear the check box for allowing inheritable permissions to propagate to the folder. On Windows Server 2008 this check box is labeled "Include inheritable permissions from this object's parent". On Windows Server 2003 this check box is labeled "Allow inheritable permissions from the parent object to propagate to this object and all child objects". Click Remove to clear the inherited permissions for the folder. Click OK, and then click OK again to close the Properties dialog box. The folder now only allows file access to the Administrators group and the Web server computer you specified. When you extend the virtual server on the Web server computer, the access control list (ACL) will be automatically updated with any additional required users or security principals. On the Sharing tab, click Advanced Sharing. Check the Share this folder check box. In the Share name box, type the name to use for the share. Be sure to use the format sharename$ for the share name to make the folder hidden when users browse the machine. Select Everyone, and then click Full Control. Click OK, and then click OK again, and then click Close to close the Properties dialog box. On the Sharing tab, select Share this folder. Giving Everyone full control to your server share is necessary so that all users of your Web site can view the Web site information and run the ASP pages required to use FrontPage 2002 Server Extensions. However, you do not want to allow other computers or other servers access to the file share and those ASP pages. It is recommended that you implement Internet Protocol (IP) Security to help prevent users and computers from circumventing the FrontPage 2002 Server Extensions and Internet Information Services security for the file share and ASP pages. Note - The separate user management feature for FrontPage 2002 Server Extensions also helps secure the process for accessing ASP pages through the file system. It is recommended that you implement this feature if you are connecting Web sites to UNC shares. For more information about managing users separately, see Authenticating Users Separately For Each Virtual Server. You use Internet Information Services (IIS) to create your new virtual server. You must also decide how to configure the security settings for your virtual server. Click Start, point to Administration Tools, and then click Internet Information Services (IIS) Manager. Click the plus sign (+) next to the server name in the Connections pane that you want to add the virtual server to. Right-click Sites, and then click Add Web Site. In the Site name box, enter the name of the Web site. In the Physical path box, type the path to the network share where the site content will go. Note that if you used the format name$ for the share, you cannot browse to the share. You must type the path exactly. In the Type box, choose HTTP or HTTPS. In the IP address box, select the IP address you want to use. In the Port box, type the port number to assign to the virtual server. In the Host name box, type the host name that you want to use (if any). Highlight the Web site you just created in the Connection pane. Double-click the Authentication feature in the Web site's Home pane. Highlight Anonymous Authentication in the Authentication pane. Click Edit... in the Actions pane. Click Specific user, and then click Set. Enter the domain and user name of your domain-level IUSR account in the User name box. Enter the password of your domain-level IUSR account in the Password and Confirm Password boxes. Highlight the web site that you just created in the Connections pane. Click Basic Settings... in the Actions pane. Make a note of the application pool name, and then click OK.
Click Application Pools in the Connections pane. Highlight the application pool from the step that you completed previously. Click Advanced Settings... in the Actions pane. Click the ellipsis (...) to the right of the Identity field. Click Built-in account, and then select NetworkService from the drop-down menu. Click OK to close the Application Pool Identity dialog box. Click OK to close the Advanced Settings dialog box. Click the plus sign (+) next to the server name that you want to add the virtual server to. Right-click Web Sites, click New, and then click Web site. In the Description box, type the description of your virtual server, and then click Next. In the Enter the IP address to use for this Web site box, select the IP address you want to use. In the TCP port this web site should use (Default: 80) box, type the port number to assign to the virtual server. In the Host Header for this site (Default: None) box, type the host name that you want to use (if any), and then click Next. In the Path box, type the path to the network share where the site content will go. Note that if you used the format name$ for the share, you cannot browse to the share. You must type the path exactly. If you do not want to allow anonymous access to your virtual server, clear the Allow anonymous access to this Web site check box. On the Web Site Security Credentials panel, verify that the Always use the authenticated users credentials when validating access to the network directory check box is selected, and then click Next. On the Permissions panel, select the permissions to use, and then click Next. If your virtual server allows scripts to be run, you must also select the Run scripts (such as ASP) check box. If you want to allow ISAPI applications or CGI scripts to be used on your virtual server, you must also select the Execute (such as ISAPI applications or CGI) check box. Click Next, and then click Finish. Note - If you chose to allow anonymous access for the virtual server, you must specify the domain account to use for anonymous users. When you use a local folder, you can use the default anonymous user (usually IUSR or IUSR_Machinename). To connect to a shared resource on a domain, however, you must specify an account with rights to the domain. Be sure to use an account with limited rights to the computers and resources in your domain. Do not unintentionally give anonymous users the ability to administer your server or print to your network printers. As stated by me earlier, this entire article does not appear to work unless you specify a domain-level IUSR account in IIS, even if you are going to not allow anonymous access. In my testing, it seems to fail when anonymous is disabled and the anonymous user had been local, whereas it succeeded when the anonymous user is a domain-account with rights to the share, even though anonymous is disabled for the site. Basic Authentication - Forwards the Web site requestor's username and password to the file server. If the user doesn't have access to the file server, he or she will not have access to the UNC-based files on the Web site. This method is best used for intranet Web sites. Another authentication method used with Kerberos delegation If you want to use another authentication method, it is more secure to use it in conjunction with Kerberos delegation. For more information about configuring Kerberos, see the Help systems for Windows Server 2003 and Internet Information Services (IIS) 6.0. Warning - Basic authentication forwards the requestor's username and password over the network. This means that usernames and passwords can be captured using a network packet analyzer. Only use basic authentication if you are sure that potential hackers don't have access to your network cabling or wireless media. In Internet Information Services (IIS) Manager, highlight the Web site you just created in the Connection pane. Highlight Basic Authentication in the Authentication pane. Click Enable in the Actions pane. In Internet Information Services (IIS) Manager, right-click the Web site you just created, and then click Properties. On the Directory Security tab, under Authentication and Access Control, click Edit. Check the Enable anonymous access check box. In the User name box for the anonymous user, type a domain user account to use for anonymous access. Note that because you are allowing access across computers, the default anonymous account (which is specific to each server) will not work. You must use a domain account for anonymous access. In the Password box, type the password that corresponds to the user account. In the Authenticated Access section, clear the Integrated Windows authentication check box, and check the Basic authentication (password is sent in clear text) check box. Click Yes to verify that you want to enable Basic authentication, and then click OK. Type the password again to confirm it, and then click OK.
Click OK again to close the Properties dialog box. As stated by me earlier, I only tested with Basic Authentication; I did not try Kerberos. Since we are making a single hop to another server, I would expect simple NTLM to fail. See KB 315673 for a description of single versus double hop setups when working with IIS configurations. But that being said, Windows Authentication in an Internet environment is impractical, so in most scenarios this point is moot. NoMachineGroups: determines whether or not FrontPage 2002 Server Extensions can create local machine accounts for new users. Because local machine accounts on one server have no rights on another server, you must disable local machine accounts and use only domain accounts to work with a shared UNC folder. Set NoMachineGroups to "1" to disable local machine accounts. Note that because this is a global setting, you should only change it before you have extended your virtual servers. If you change this setting after a virtual server has been extended, the administration pages may not work. AllowUNC: specifies whether or not to allow shared UNC folders. You must set this entry to "1" to enable UNC folder sharing. If these subkeys do not exist yet, you can add them as new string values, and then set them to 1. Open the Registry Editor on your Web server computer. To do so, click Start, click Run, and then type regedit. If you see the NoMachineGroups and AllowUNCkeys, skip to step 4. If not, you must create these keys as described in the next step. Right-click in the right pane of the Registry Editor Window, click New, and then click String value. In the right pane, right-click NoMachineGroups, and then click Modify. In the right pane, right-click AllowUNC, and then click Modify. After the virtual server has been created and configured, you are ready to extend it with FrontPage 2002 Server Extensions. You must extend the virtual server before you can publish Web site content to it. Click Start, point to Administrative Tools, and then click Internet Information Services (IIS). In the console tree, click the name of the computer where you will create the virtual server, and then click Web Server Extensions. In Web Server Extensions, click FrontPage Server Extensions 2002, and then click Allow. Click Start, point to Administrative Tools, and then click Microsoft SharePoint Administrator. Click Extend next to the virtual server you just created in IIS. In the Administrator user name box, type the user name, and then click Submit. cd /d "%ProgramFiles%\Common Files\Microsoft Shared\Web Server Extensions\50\bin"
As I mentioned in the beginning of this post, there are a lot of steps to get this working, but it's possible to do so. Converting all filenames to lowercase. Converting all non-alphanumeric characters to underscore characters. tmpNewName = tmpNewName & "_"
This FrontPage VBA Macro is designed to return an array of all the folder URLs for the currently-open web site. I call this function from a lot of my other macros.
' Check the caption of the application to see if a web is open.
' ... and end the macro.
' Change the web view to folder view.
' Refresh the web view and recalc the web.
' Define the initial values for our folder counters.
' Dimension an aray to hold the folder names.
' ... and store the URL in our array.
' Loop while we still have folders to process.
' Set up a WebFolder object to a base folder.
' Loop through the collection of subfolders for the base folder.
' Check to make sure that the subfolder is not a web.
' Increment our folder count.
' Store the folder name in our array.
' Increment the base folder counter.
' Get the name of the next folder to process.
' Return the array of folder names. This FrontPage VBA Macro is designed to reformat the HTML for every HTML or ASP file within the currently open web site. Earlier today Microsoft and Ready-to-Run Software released to web the Release Candidate 1 (RC1) version of the FrontPage 2002 Server Extensions for IIS 7.0 on Windows Server 2008 and Windows Vista. This build now includes a combined installation package for 32-bit and 64-bit versions of Windows.